BEIJING - Recent Chinese naval exercises were routine and had nothing to do with the situation in the South China Sea, a spokesman for the Ministry of National Defense said on Wednesday. 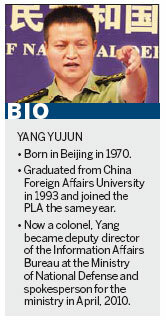 "We have noted media reports about the navy's training activities," Yang Yujun said at a news conference. But he asked the media not to read too much into the "normal training activities". The People's Liberation Army recently conducted a series of exercises, including one off the southern island province of Hainan, raising speculation they were related to tension in the South China Sea. Disputes over territory in the sea have come into the spotlight recently, with Vietnam conducting live-fire naval drills in mid-June, and the Philippines holding an 11-day joint exercise with the United States that started on Tuesday. Both Vietnam and the Philippines have made competing claims against China over the South China Sea. Yang said that China's position has been clear and consistent. "China advocates a peaceful solution to disputes over the South China Sea through talks and consultations between nations directly involved," he said, adding that China has indisputable sovereignty over islands in the South China Sea and adjacent waters. Part of the reason for tension in the region is increasing US intervention, Ma Zhengang, former Chinese ambassador to the United Kingdom, said. US Secretary of State Hillary Clinton said in July last year, at an ASEAN meeting, that the US has "a national interest in freedom of navigation in the South China Sea". The US is reasserting its influence in the region, while those countries that have competing maritime territorial claims are using the US to balance China, Ma said. Yang said that the freedom of navigation in the South China Sea has never been an issue despite the disputes. "Peace and stability in the region accord with the interests of Asia-Pacific nations, including China and the US. We hope relevant nations will do more to facilitate peace and stability in the region." On the joint naval drill between the Philippines and the US, Yang said bilateral defense cooperation should not target a third party, or compromise the interests of a third party. Fan Jishe, a professor of American studies at the Chinese Academy of Social Sciences, said US intervention "will complicate the situation in the South China Sea". Yang also announced at the news conference that Admiral Mike Mullen, chairman of the US joint chiefs of staff, will visit China next month. The July 9-13 visit is in return for General Chen Bingde's trip to the US in May, Xinhua reported. Yang also congratulated Leon Panetta, who is replacing Robert Gates as US defense secretary. The visit of Mullen will "help the two countries minimize the risk of misunderstanding over the South China Sea issue", Fan said.